Review: It had been a while since I wanted to read this new volume of the Alex Craft’s adventures. I must say that the previous volume left us hungry with many questions about the result of Alex’s relationships with Falin and Death but also in relation to her new condition. Alexis will have in this novel to deal with several suicides that finally seem to be a series of murders that nobody understood. With the help of Royce and her friends, she will try to solve this mystery without realizing that this case is more dangerous than any she could have worked on before, especially now that the police does not want her mingled with their work. I was immediately intrigued by the unexplained deaths, the assumptions and conclusions of our heroine while we follow her throughout the story, making us doubt and understand about what is happening. By finding the answers we do not expect such repercussions on the Alex life. Grazing death many times, battling each time for survival and even risking everything to save her family. I also looked forward to see what would happen with Falin and Death and I’m really not disappointed. I admit that our heart is broken for our heroine against these impossible two relationships. While she tries to find some solutions, nothing is easy. And when we finally think there is a glimmer of hope, she is quickly brought back to reality. Regarding Falin, our FIB agent, we see soon enough where this story will lead, especially being under the yoke of the Queen of Winter. I didn’t, however, imagine the twisted mind and terrifying ideas she may have, and when she is against our young detective, she is actually very imaginative, especially with this horrible end. What an idea to finish with such an event? How am I going to wait for volume 4 now? My heart will definitely balance for Death, he is really touching and their forbidden relationship attracts me every time. Hopefully he will find a solution to be with her but we doubt that it will not be easy. But it is with pleasure that we see what they are willing to do both for their happiness. But how not to fall for this character when we see who he really is. We learn much more about the job of Death and what it means, his nature and his powers , which was really interesting because we only had glimpses of it. We’ll understand as well the Fae world and the person that Alex is becoming gradually. I also look forward to see what status she will eventually choose. The problems are just beginning and I can not wait to see what will happen. As always I was totally carried away with this new adventure, as the story is well written. 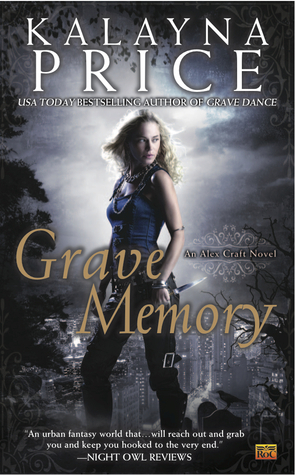 Alex Craft is one of my favorite series and I am never disappointed by the Kalayna Price’s ideas. A nice mix of mystery, conspiracy and love. Great to hear this one did not disappoint! I’ve been seeing this around but as I’m swamped and swarmed with so many good UF/PNR, I often find myself lost as far as figuring out what book to read next. But at book 3, I think I can still catch up with this. Maybe if I stop blogging for a year, that will help me level my TBR to a respectable number. It’s a great series, i can’t wait for book 4. LOL I know, right? We definitely need more time. What is it about Death becoming a character that makes him so interesting? You have me wanting the others in this series and I really need to get them all! Oh my goodness! I’m terrible. I know I’m going to love this series and haven’t even started the first book that’s waiting for me on my shelf! I so love this series, it is hard to have to wait so long for book 4.